Double Helix Optics was named the overall winner in the first round of the Luminate NY competition. The Boulder, Colo.-based company will receive $1 million in follow-on funding from New York state through the Finger Lakes Forward Upstate Revitalization Initiative. As the award stipulates, Double Helix will commit to establishing operations in Rochester for at least the next 18 months. Double Helix Optics was awarded first place for its SPINDLE, a light engineering technology for integrating depth information with increased resolution into real-world applications. SPINDLE is a 3D nanoimaging module that seamlessly integrates with existing microscopes, cameras, and other optical instruments to turn 2D imaging into 3D information capture. 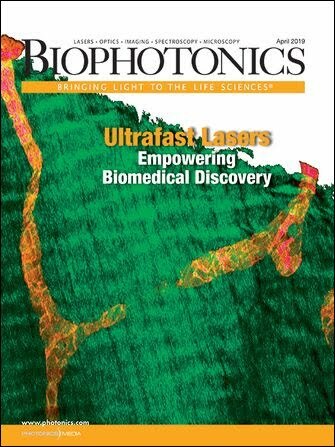 Intelon Optics Inc. was the second-place winner, receiving $500,000 for its Brillouin Optical Scanner System (BOSS), which uses laser light to measure the stiffness of tissues inside the body. Positive Science was named third-place winner, securing $250,000 for its head-mounted eye-tracking and behavioral analysis systems. Fourth place was awarded to Think Biosolution, which received $250,000 for its wearable devices and software platforms, which use QuasaR technology to measure heart rate, respiratory rate, blood oxygen saturation, heart rate variability, temperature, movement, and location. A panel of judges from the optics, photonics, and imaging (OPI) industry and venture capitalist community scored Luminate NY candidates based on their business pitches. The more than 600 attendees at the event also had an opportunity to vote for their favorite company. The Audience Choice award for $10,000 went to Molecular Glasses Inc. for its creation of a new class of materials capable of reducing power consumption in mobile applications while also providing higher display resolution and enabling lower-cost manufacturing processes. Luminate NY, which is administered by NextCorps, is the world’s largest business accelerator for startup firms in the OPI industries. Located in Rochester, N.Y., it selects 10 promising companies each year and provides comprehensive training and resources to advance their technologies and businesses. Applications are being accepted for Round II of the Luminate 2018 competition now through Sept. 24. Companies earning one of the 10 available slots in the next cohort will receive a minimum investment of $100,000 and major investments of up to $1 million.